What did the writing on the plates look like? Can there be any comparison to known ancient languages? Aside from the 'Caractors' roughly drawn by Joseph or perhaps one of his scribes, we have little to go on. What is Reformed Egyptian anyway? And more importantly, what do Book of Mormon writers say themselves about the languages they used? Our first clue comes very early in the record, when Nephi tells us that his record is in the language of his father. He then goes on to tell us that it consists of the 'learning of the Jews and the language of the Egyptians' (1 Ne 1:2). Admittedly, we don't know exactly what he means, but obviously, Lehi and his family would have spoken Hebrew, the language of the Jews. We might think we know what Hebrew looks like, but the written language was changed anciently. The block script used today was adopted by Jews in the third century BC. Before that, they used an older script called paleo-Hebrew. In the image below, the two writing systems are compared. Aleph starts on the far right, then Beth, then Gimel, and so on. Remember that Hebrew, like other Semitic languages, was written and read from right to left. The familiar Hebrew alphabet on the top line would have been unknown to the Jews of Lehi's day. They would have been using the characters shown on the bottom line. However, Nephi seems to be telling us that he did not use Hebrew as the written language on the plates. Instead, he refers to Egyptian. It should be fairly obvious that he was not using hieroglyphics. Two other writing systems were known among the Egyptians of Lehi's day: Hieratic and Demotic. Hieratic was an early cursive writing system developed for writing with a reed brush and ink. By about 660 BC it had been replaced by Demotic for secular writings, but the priestly class continued to use Hieratic for quite some time. The question is, which system, Hieratic, or the early Demotic of his day, would Lehi have known and taught to his son? Even though Hieratic continued to be the language of religious writings, that was just among Egyptian priests. In fact, the word Demotic is derived from the Greek term for 'popular.' 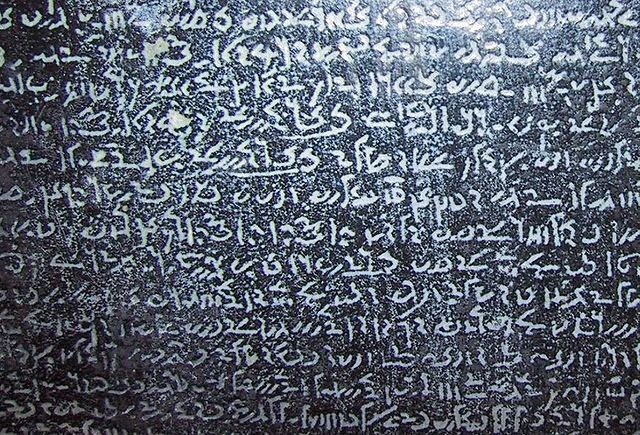 Egyptians referred to this written language as 'document writing.' It was commonly carved on monuments and is one of the languages found on the Rosetta Stone. It is likely that Lehi, as a non-Egyptian visitor, would have learned Demotic, shown below. In addition, Hieratic is known for its ligatures and highly cursive nature, which may have been difficult to reproduce by engraving on plates of metal ore. For these reasons, Demotic would have been a more likely choice, but Nephi does not tell us why he chose Egyptian over Hebrew. His aforementioned statement has been interpreted by some LDS scholars as meaning that he used Egyptian letters to transliterate Hebrew words. Whatever Nephi did, it is also apparent from the Book of Mormon itself that Mormon did not copy, translate, or condense the duplicate record he found, known as the small plates of Nephi. He found them among other records in his possession. and because he found the words on these plates pleasing, he put them with the remainder of his record (WoM 1:6). Not only were these plates likely smaller than the ones Mormon had made centuries later in the 4th century AD, but they were written in a completely different and much older language than he was using on his plates: the early Demotic of 600 BC! Regarding the language used for their record, Moroni tells us they wrote in what the Nephites called Reformed Egyptian, the most enigmatic writing system connected with the Book of Mormon. This was mentioned only once at the very end of Nephite history and was unknown to the original Nephi and probably many record keepers after him. No one besides Moroni refers to it. The only surviving example of it is presumably in the 'Caractors' drawing. We should not expect to find other examples of it, because it had evolved over the years and was known only among the Nephites; no one else knew it (Mor 9:32-34). It may also be that only keepers of the sacred records used this language. They also kept a knowledge of Hebrew alive, but Mormon chose the Egyptian over it because it was more concise (if less perfect) for writing. We are told that both Egyptian and Hebrew had been altered by the Nephites, which one might expect after being isolated from their original sources for almost a millennium and surrounded by different cultures. By Mormon and Moroni's time, Demotic had changed into reformed Egyptian and we must expect that paleo-Hebrew had become reformed Hebrew as well. Regardless of what common Nephites spoke, or what acted as a lingua franca so that different groups could communicate with each other, we know that an elite group of Nephite record holders kept alive a Semitic written tradition, including the languages and the practice of writing on metal plates. As with many Semitic languages, both Demotic and Hebrew are written from right to left and Joseph Smith confirmed that the script on the Book of Mormon was read in the same manner. As we try to imagine the origin of Nephite languages, we must start with what would have been known in the Middle East of 600 BC: paleo-Hebrew and early Demotic Egyptian.